Years ago, there used to be a Cinnabon in our local shopping centre. 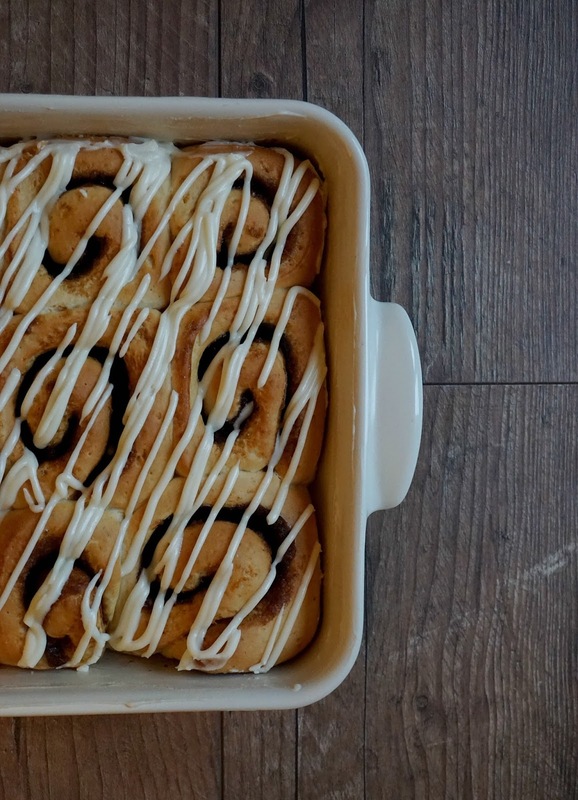 This started my love affair with cinnamon rolls. 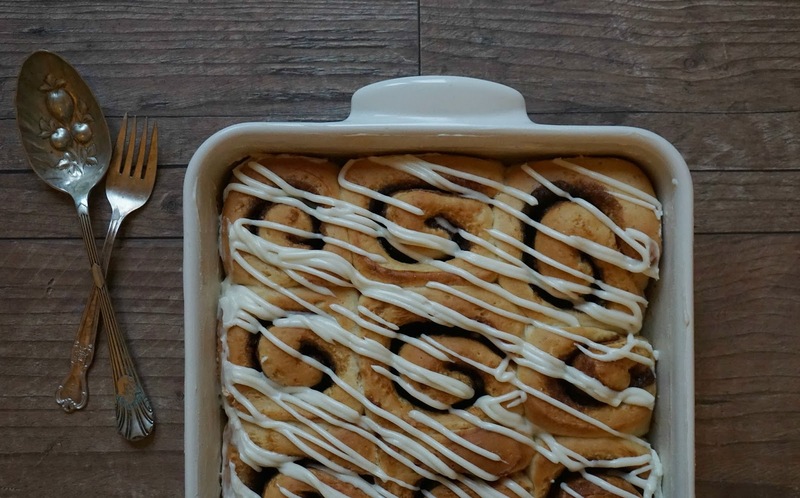 Warm, gooey, with a light sweet dough, cinnamon rolls are that perfect Autumnal treat. But they are still quite a rarity in the UK, with most recipes using US measurement systems and ingredients. 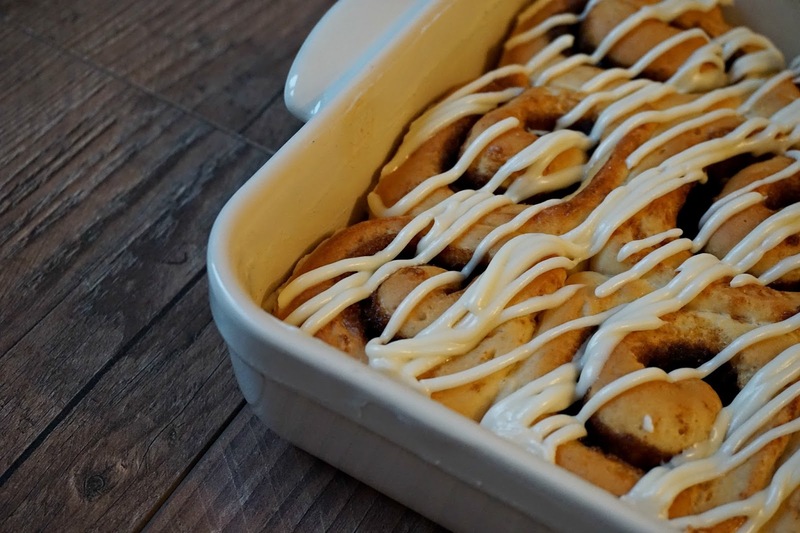 So after a while spent Pinning, researching and recipe testing I've finally sussed out a simple and super tasty cinnamon roll recipe! I've taken bits from a handful of different recipes and techniques, and adapted quantities and measurements along the way. 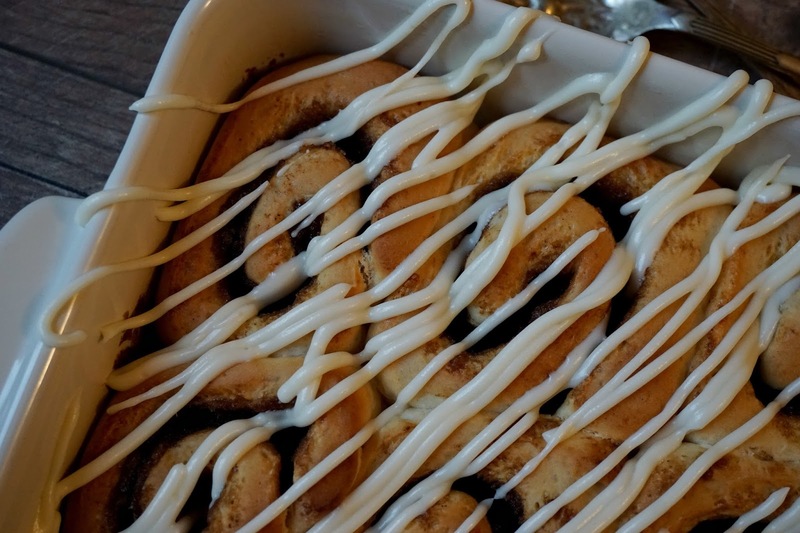 These are my 'standard' cinnamon rolls; by browning the butter you're given added depth and richness, and the frosting adds moisture. 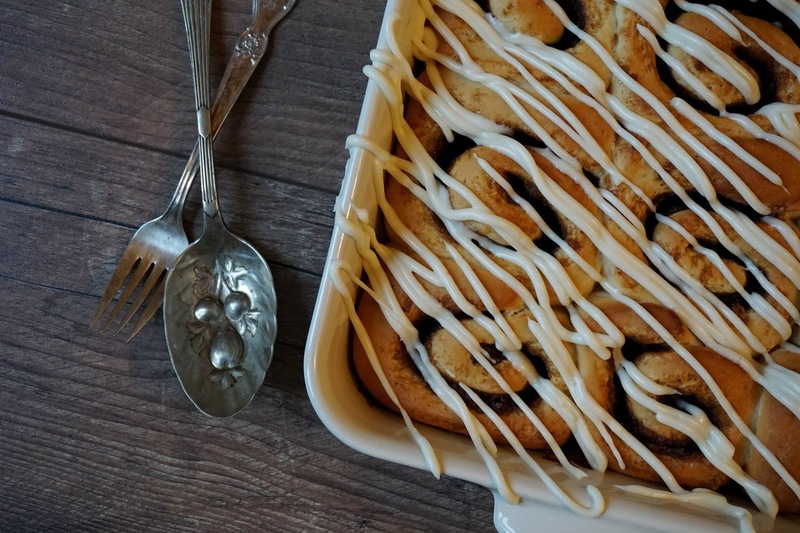 Watch this space over the coming weeks, as I'll also be sharing a festive take on the recipe! You'll need a baking dish around 13 x 10 inches in size, although sightly smaller would be fine. Warm the milk in a pan - don't boil - and add the butter to melt. Leave aside to cool slightly. In a mixing bowl, add 335g of your flour (put the rest aside for a minute), the yeast sachet and caster sugar and combine. Then add the water, egg and the milk/butter mixture and beat well with a wooden spoon. Add the remaining flour (you should have 190g left over) a bit at a time, mixing well. It should feel like a little workout now, as your dough starts to come together! It should be pretty sticky by this point. Place it on a lightly floured surface and gently knead for a few minutes until smooth. You should be able to poke it and see it spring back up. Cover with a damp cloth and leave whilst you make your filling; around ten minutes. Quickly wash up the pan you warmed the milk in, and use to make the filling. Add the butter and put over a medium heat until completely melted. It then should start popping, and slowly turning brown in colour - this should take a few minutes. Be careful not to have the heat too high or it'll burn. Roll your dough out on a lightly floured surface to a large rectangle, approximately the size of your baking dish. Pour over your brown butter and smooth over the whole rectangle using a pastry brush. 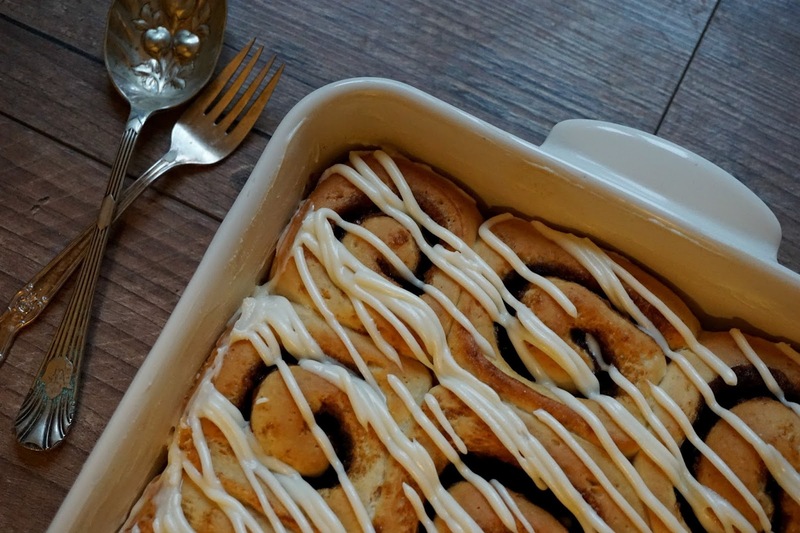 Combine the sugar and cinnamon in a small bowl, before pouring over the buttery pastry, filling right to the edges and pressing the sugar down with your hands to keep in place. Roll the dough length-ways (along the long side), not too tightly, but enough to have a couple of rolls. Pinch the seam to seal, and cut in to twelve equal sized rolls. Grease the tin with butter, and place the pastry roles in. Cover with a tea towel and leave somewhere warm to proof for thirty minutes - they should double in size. I don't have a airing cupboard or similar, so warm my oven to 100°C, turn off and pop in there. Once proofing finished, pre-heat your oven to 180°C and bake for around twenty minutes, or until golden. Beat together the butter and cream cheese - ideally with an electric mixer - until smooth and slightly whipped in consistency. Add the vanilla extract, and then the icing sugar gradually. I piped the icing on, but in all honesty they taste best when smothered liberally with the stuff! Serve warm with coffee and feel your life improve tenfold!